Lately we have been seeing Crested Guans (Penelope purpurascens) along the road up in the trees heading up to Friends of the Osa’s Osa Biodiversity Center at Cerro Osa. I first noticed a family of 4 Guan individuals in one of our forest restoration plots a few weeks back as I was conducting bird counts. The adult female of the group became fairly agitated as I walked right underneath her on my way to my next monitoring point. I assumed she either had a nest or was with her young of the year. Though my nest searching instincts tend to be very strong I left her alone as I continued on with my bird count. They can be quite loud when they feel threatened and I was unable to hear any other birds in the forest with her so upset. Since then we have seen several Crested Guans (or Penelope, as they are fondly referred to as here in Costa Rica for its genus), along the road and so I thought this would be a good time to introduce them here on the pages of our blog and talk a bit about why it is so special to have them here. Oh, and they are also called Pava which means turkey in Spanish. The Crested Guan is quite large, about turkey size, weighing in at about 1.7 kg. Because of their large body size and evidently tasty meat they have been hunted along with other species in the Cracidea family such as Curassows, Guans and Chachalacas all throughout their range. Larger bodied birds tend to have low abundance, and that along with a small clutch size of 2 to 3 eggs, a slow reproduction period (incubation alone may take as long as 34 days), and hunting pressure makes this species rare in unprotected forests and more vulnerable to changes in the landscape. Why are these species so important you might ask? These species are essential to the biodiversity of the tropical rainforest because they are mainly frugivores (fruit eaters) and play an important roll in fruit seed dispersal which helps with seed germination and forest regeneration. When we lose large seed dispersers like Crested Guan we lose the mechanism by which larger seeds are moved and placed elsewhere for them to germinate and take root. This is why it is so special to see them around here as much as we do. Cerro Osa is a 600 ha parcel acquired by Friends of the Osa in 2008 and is an important area for species protection and conservation. Now with the decrease in hunting pressure and our forest restoration projects underway, we hope to be seeing a lot more Crested Guans, Great Curassows and Gray-headed Chachalacas here at the Osa Biodiversity Center. 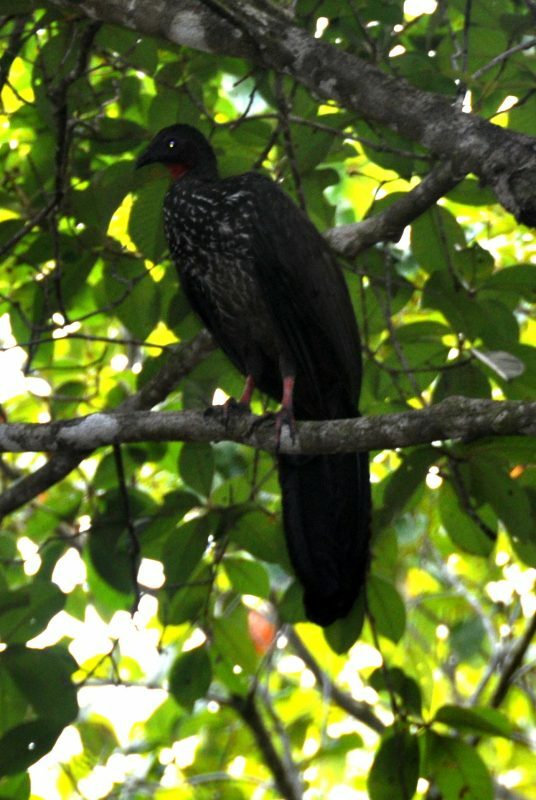 The Crested Guan was photographed here at the Osa Biodiversity Center at Cerro Osa by Kory our managing director here at Friends of the Osa.